This is a time for both silence and for speech….silence, because we are at a loss for words; speech, because we understand the power of words to harm and to heal. We’ve gathered on the Green, the very heart of our community, to share our horror, our grief, our anger and our resolve. The violence that erupted in Tree of Life Congregation on Saturday morning had a tragic context, that of unspeakable violence directed at faith communities. It brought to mind the murder of nine African-American worshipers at Charleston’s Mother Emanuel Church in 2015; the murder of 26 worshipers in a Baptist Church in Sutherland Springs, TX in 2017; the killing of six Sikh worshipers at a temple in Oak Creek, WI in 2014; the murder of two African-Americans in a Louisville, KY supermarket when the shooter failed to gain access to a Black Church; and, of course, the bombing of Birmingham, AL 16th Street Baptist Church that left four young African-American girls dead. Ours is a nation awash in deadly violence, much of it directed against minorities: people of color, Moslems, members of the LGBTQ community, Jews, immigrants and refugees. That violence is fomented and abetted by words…words that demonize, inflame and fabricate and which are heard everywhere on social media and at every level of government. Part of what we can do is precisely what we are doing at this moment: offering support and consolation, manifesting our resolve not to retreat into indifference or despair. The late and revered Fred Rogers, better known to many as “Mr. Rogers”, whose Squirrel Hill home was just blocks from that synagogue in Pittsburgh, offered this helpful advice. He said, ‘When I was a boy and I would see scary things in the news, my mother would say to me, ‘Look for the helpers. You will always find people who are helping.’‘ How true that it is! You need only look to your right or left or across this circle to see a helper. On Saturday morning I was teaching Torah in my congregation. I had not yet heard the terrible news from Pittsburgh when I saw in our congregation’s parking lot a Falmouth Police Department cruiser, a visible sign of concern and protection. Chief Edward Dunne reached out quickly with messages of condolence and support. Congressman Bill Keating, who is otherwise occupied with a debate this evening, phoned yesterday to convey his deep concern. The Town Manager’s Office and the Department of Public Works graciously offered their assistance to help make this vigil possible. The helpers are here and we must count ourselves among them. In the days that followed that vigil, expressions of support and concern for our Jewish community flowed in. On the very next Shabbat morning we held a shortened service and invited the community-at-large to join us for worship and a discussion that followed so as to process, collectively, the impact of that act of terror in Pittsburgh. Goode Chapel was filled to overflowing and what emerged from that conversation was a palpable sense of sadness and frustration that our nation is experiencing such paroxysms of violent hatred as well as a resolve to forge deeper connections with our neighbors in this community as a partial antidote to venomous fear and violence. As we approach the darkest days of the year, I will take special solace this year in the ritual of lighting Chanukah candles whose increasing glow, over the course of eight nights, brings an ever-new reminder of the power of light to banish darkness. 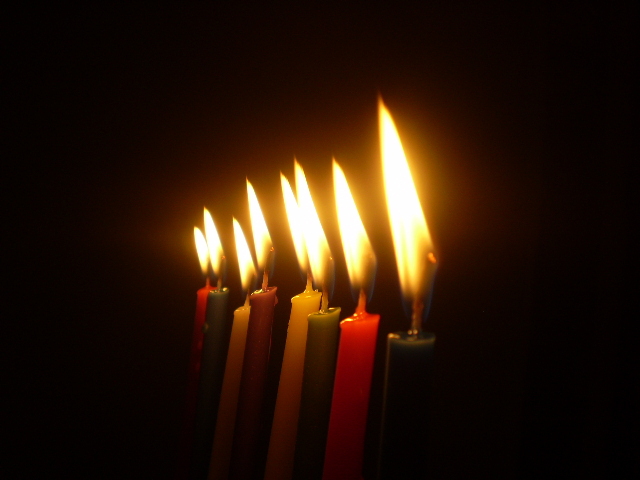 That Hebrew word Chanukah means “dedication”, an apt reminder of our need to redouble our dedication to shaping and preserving the kind of society that all of us, most especially the marginalized and demonized among us, need and deserve.